Negotiations are preparing to heat up over the teachers contract that will expire in June. To read tweets from this event on Storify, click here. For Catalyst Chicago’s interactive timeline of the negotiations and possible next steps, click here. Thousands of Chicago Teachers Union members held a boisterous rally at the Auditorium Theatre on Wednesday afternoon, with many teachers showing support for a possible strike in the fall. Union officials announced on Tuesday that a strike vote would likely be taken before the end of the year and that 95 percent of the members who voted in a union survey would reject the current CPS proposal. CPS argues, however, that the union is inaccurately portraying the district’s offer to teachers. “We respect our teachers and the work they do on behalf of our kids every day. They deserve a raise for that work, but our children can’t afford a strike. That’s why we are working with an independent negotiator to find a compromise proposal that fairly compensates our teachers and starts the school year on time,” schools CEO Jean-Claude Brizard said in a statement. Randi Weingarten, head of the American Federation of Teachers, was among those who spoke at the rally. Earlier at the board of education meeting, the advocacy group Stand for Children held a press conference featuring parents who don’t want to see a strike occur. Michael Butz, who has a son at Disney, said that if the teachers strike, parents will be left scrambling to figure out what they should do with their children. Like many, both Butz and his wife work. Stand for Children, which is a national organization with a local chapter, pushed for the passage of Senate Bill 7. The bill establishes a process for calling a strike and requires 75 percent of the teacher union membership authorize a strike. Currently, CPS and CTU are in the fact-finding stage of the process in which an independent arbitrator considers both proposals and issues a report. That report is due by July 15. Stand for Children Chicago Director Juan Jose Gonzalez said that the organization thinks it is disingenuous for teachers to call a strike authorization vote before the fact-finding report is released. “It is not true to the process,” he said. 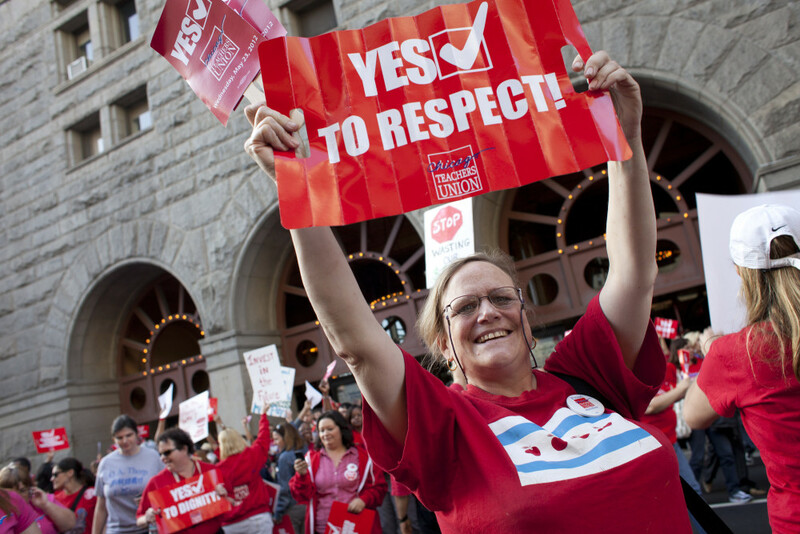 CTU officials have said the high threshold for approval of a strike authorization vote forces them to schedule it before the end of the school year. Waiting until the summer would make it difficult, if not impossible, to get all members to vote. The way the law works a non-vote is essentially a “no” vote. Gonzalez would not speak to whether the Senate Bill 7 inadvertently created the need for an imminent strike authorization vote. Instead, he insisted the bill’s purpose was to make the process more transparent. Teachers at the rally were given stickers and hand-held red paper fans that doubled as signs, with check marks in boxes on them — likely an allusion to a coming strike vote – next to the phrases “YES to small class sizes” and “YES to well-funded neighborhood schools.” Popcorn and union T-shirts were on sale in the lobby. The rally was followed by a 6,500-strong march to CPS headquarters that joined with a protest of the Chicago Mercantile Exchange. As members filed into the theater, a video showed CTU members reminiscing about past strikes, and members stood up and started clapping to an old-style version of “Solidarity Forever.” When “We Shall Not Be Moved” played, the video switched to a slideshow of the union’s leadership. Next, the video segued into pop hits like “R-E-S-P-E-C-T” and slideshows of CTU pickets. “I am willing to do whatever is necessary to ensure our members get a fair contract – are you?” she asked the audience. One video that played had messages of support from leaders of Chicago’s SEIU and UNITE-HERE locals. Another showed parents and other Chicagoans talking about the positive impact of teachers on their lives. Speakers from 19th Ward Parents and Raise Your Hand also appeared at the rally. Raise Your Hand’s Matt Farmer, in a fiery speech, noted that the University of Chicago Laboratory Schools have seven fine arts teachers. He also quoted the schools’ director criticizing standardized testing and praising teacher unions. Later, Illinois Federation of Teachers President Dan Montgomery spoke in support of the CTU. “When the current fight is over you will be prouder than you ever have before; you will have more power than you ever had before,” he said, his voice drowned out by cheering. Emma Mitts is facing challengers who are seeing support in the West Side ward, slated to become the site of a controversial new police academy. Rahm and J.B. are the leading donors; unions play an outsized role; your cable bill may be paying to support your alderman; and more.